Preheat toaster oven or regular oven to 375ºF (190º). Place tortilla on counter. Use rubber spatula or table knife to spread ketchup or sauce over tortilla; sprinkle seasoning over ketchup. 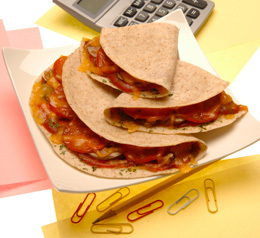 Arrange mushroom slices on ½ of the tortilla and top mushrooms with pepperoni slices. Break the cheese slice in half to fit over pepperoni. Fold other half of tortilla over the cheese; press gently. Spray toaster oven baking pan OR small baking sheet with cooking spray; using pancake turner, place folded sandwich on pan. Spray top of tortilla with cooking spray. Bake in oven for 6-8 minutes or until slightly crisped and cheese is starting to melt. Turn off oven. Using oven mitts, remove pan to cooling rack and let stand 2-3 minutes, eat as a half moon sandwich or cut in half with pizza cutter or sharp knife. Serve with more ketchup or pizza sauce for dipping if desired. Tip: Instead of baking in oven, spray a non-stick skillet with cooking spray; place on burner over medium heat. Using pancake turner lift sandwich into skillet and cook sandwich for 3-4 minutes, turn over with pancake turner and cook until lightly browned on the bottom.